What if the Milky Way is just a big bowl of noodles and the sun was the egg on top? 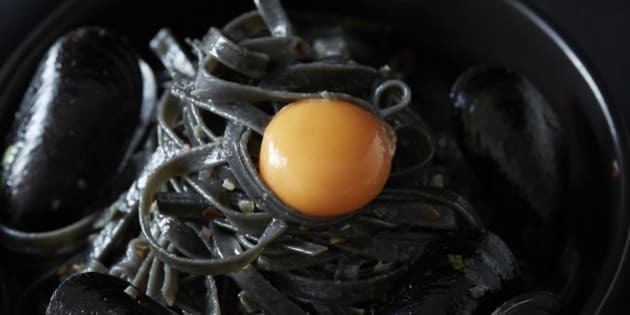 This totally-made-up crackpot theory actually has a skerrick of scientific reason to it -- CSIRO has published a paper describing 'dark noodles' in the Milky Way that act a bit like lasagna. Or maybe hazelnuts. I know, we're hungry too. Astronomer Keith Bannister explained the discovery to The Huffington Post Australia the same way he explained it to his three kids. "Basically, I tell them I found a blob in space," he said. "So you might have been taught in school that space is a vacuum, but it's not. Between the stars there is this gas, and we know there are blobs in the gas because we can see light refract around them." The researchers used the CSIRO’s Compact Array telescope to watch how light from a distant galaxy (called a quasar, if you're interested) as it refracted around those blobs, giving an idea of their shape. After ruling out a whole bunch of shapes, what's left is a lasagna sheet, a hollow noodle and a hazelnut-style hollow shell shape "a bit like a Ferrero Rocher". "The hazelnut option is particularly interesting because we can see the shell, but we can't see the guts, and the shell's being held together by gravity." He said he had a hunch the gravity source was a bunch of enigmatic particles called baryons, which, for the time being, we can think of as the creamy centre of a Ferrero Rocher. Now, who's up for a meal of lasagna, hazelnuts, Milky Ways and Ferrero Rochers?